This cavernous cafeteria is a repository of New York history—glossies of celebs spanning the past century crowd the walls, and the classic Jewish deli offerings are nonpareil. Start with a crisp-skinned, all-beef hot dog for less than a fiver. Then flag down a meat cutter and order one of the legendary sandwiches. The brisket sings with horseradish, and the thick-cut pastrami stacked high between slices of rye is the stuff of dreams. Everything tastes better with a glass of the hoppy house lager; if you’re on the wagon, make it a Dr. Brown’s. Time Out tip: The When Harry Met Sally table is labeled in the center of the restaurant. Snag it if you can. Definitely stick only to the pastrami sandwich here. The rest is for light weights! Its a 25 dollar hit, but it truly is perfect. Their House IPA to pair. Heh, after 125 years, they have it down pat. Amazing cultural experience. 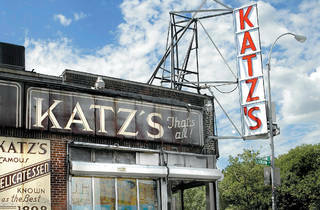 Katz's is somewhere you're sure to have heard of, regardless of where you live. And unlike some places, not only does it live up to it's reputation, it surpasses it. After your first visit you'll be hooked, and will keep coming back time and time again. 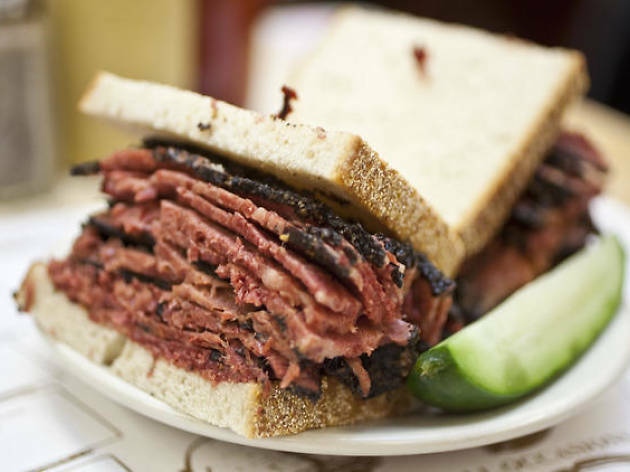 The pastrami sandwiches are second to none, and are so big they'll keep you feeling full all day! what a classic! the pastrami reuben sandwich is absolutely delicious. you can also definitely share the sandwich, or take half home. they also serve the sandwiches with pickles, which is always a plus. The Pastrami sandwich is their signature dish and always remember to keep your ticket at the door. 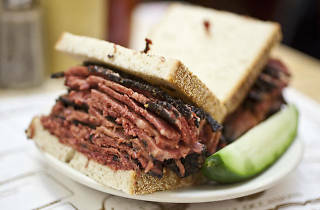 The pastrami itself is juicy and tender. I love how they cut a slice of meat for their customers to eat before serving the sandwich. Cannot go wrong eating it late at night!!! This famed New York establishment requires no review but this: go order a Pastrami (and some pickles) and don't lose your ticket! Ok, everyone knows this place is renowned for their meats, specifically the reubens. I had one and man do they pile on the meat! Sandwiches are a bit expensive, but there's a lot of meat and they'll definitely fill you up. 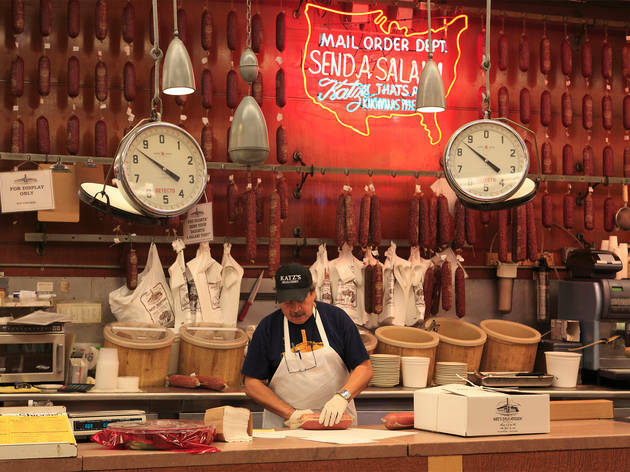 It's an old school deli that does meats really well. You can't go wrong with anything here. Meat is moist and beyond flavorful.So get on over and chow down! Everyday is packed with locals and tourists, but I have to say its pastrami sandwich can change your life. 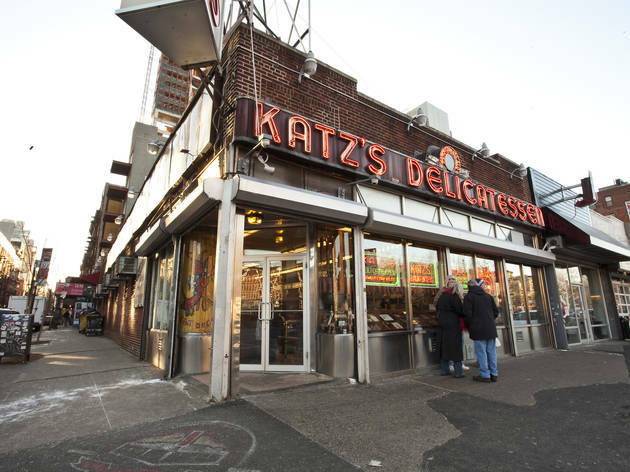 Katz’s Deli isn’t just a place to go for meat piled high sandwiches. It’s a New York institution. It can be sometimes annoyingly packed and overrun with tourists, but the staff keep it all moving like a well - oiled machine. Vegetarians, might want to go elsewhere, because this place is all about meat. 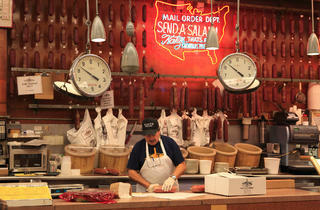 They select the best cuts of beef for their mouth- watering pastrami, brisket, and corned beef. 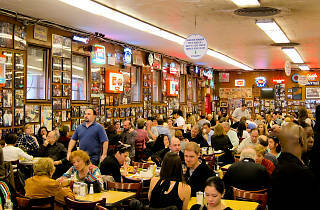 You might want to fast a day prior to eating at Katz’s Deli, as the portions are beyond huge. They do have half sandwich and soup or salad options though, for those of you who are counting calories. THE. BEST. PASTRAMI IN NYC. Granted it will be a zoo during prime meal hours, but it is more than worth it. A must for the true NYC experience. Authentic old-school deli piled high. The place itself is iconic and it's decor is kind of musty and woody. There will be a bouncer, and you will wait on line. Besides that the experience is enjoyable, maybe even feels exclusive, and then you'll plop down and wait. The service staff is just okay, but the food really is that good, and they will give you much too much. The pricing is just okay - kind of high, but in terms of the quantity and quality received, not that bad in context. Though I’m a vegetarian, I can still find so much to appreciate whenever I dine at Katz’s (which is whenever my parents or friends come to town). The atmosphere alone is worth a visit, with photo-lined walls that feature notable past patrons, the no-fuss order-at-the-counter service and the family-owned aura the institution gives off. The deli feels representative of the New York City of another era. So while I’ve only tried the pickles, fries, cole slaw and split-pea soup (all of which are great), the pastrami lovers I’ve taken to Katz’s have all left happy and full (and with slimmer wallets). 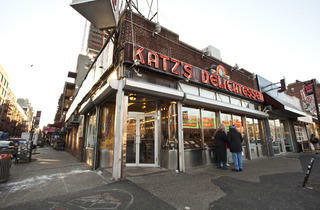 What is there to say about Katz's Delicatessen, besides that it serves the best food in the world. 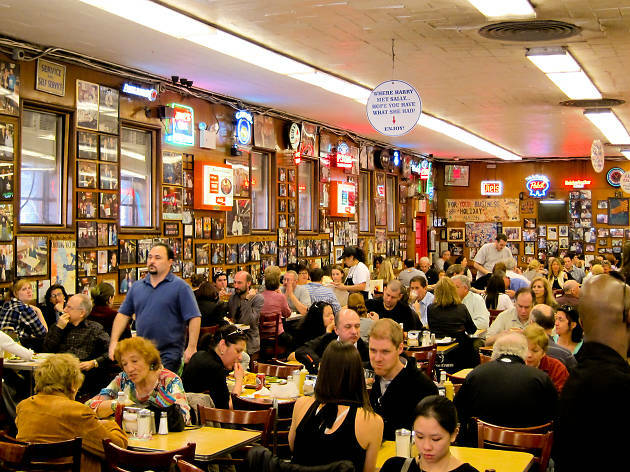 If you live or work in New York City, or visit with any regularity, you should be visiting Katz's at least once every two months to recalibrate your body and mind. It's important. Go during a weird time and you'll have your run of the place. Then you can celebrate your good judgement by ordering a pastrami sandwich. That's really all you need. It costs what it costs and what you're getting is still a huge bargain because have I mentioned it's the best? Oh and don't lose your ticket. 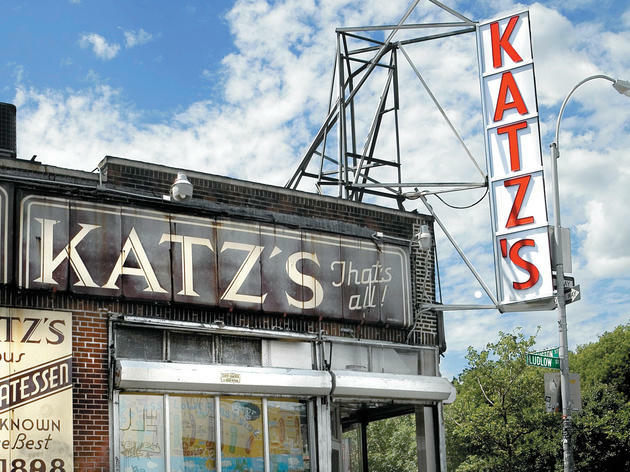 Katz's is not only a New York icon, but an American icon (as made famous infamous in When Harry Met Sally), so it is definitely worth paying a visit. It's very bar bones, old-school and extremely casual. The food is okay, very traditional Jewish deli food with HUGE portions, but it is extremely overpriced (as are most tourist-attractions). I recommend visiting after a night out in LES, just make sure to think with your wallet, not your booze-fueled appetite, because you can wind up racking up a very high bill (and be sure to keep hold of your ticket, because if you lose it, you'll get charged a ton). The counter-staff is also very boisterous and friendly, at least after 2am on the weekends. If I took up all (or any for that matter) of the proposals I've received there, I'd be on at least my 6th marriage by now. Check it out, but not really worth revisiting. Very much so a deli style restaurant. I would suggest to not go during peak hours, as this is very popular and it can be hard to get a table. The knishes and matzo ball soup are my favorites! (The matzo ball soup has a giant matzo ball - the size of a baseball)! Amazing food! Obviously a must visit if visiting NYC. I recommend sharing...the pastrami sandwich is HUGE! Go during the week or off peak hours.